This is a third part of the Allsky cycle. Part 1. Autonomous Allsky camera with Raspberry PI: overview. This time I will show my utility and script for shooting night sky and processing of the images. In this project I’m using popular and cheap QHY5-IIM CMOS camera. This camera is holded by aluminium ring (came with camera) and few bronze stands. Optics – CCTV, “Сomputar 1.8-3.6mm 1.6” with motorized iris. This helps to protect CMOS sensor in a daytime. 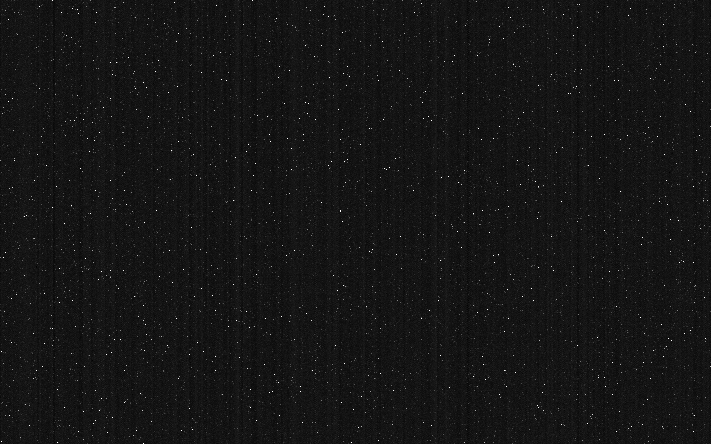 Also we can shoot special calibration images – darks and biases. Calibration process will be described below. To able to control this iris I done a little research of the lens electronics. Motor is controlled with few operational amplifiers. I found that pulling down one of the opamp inputs causes closing the iris (default state is open). Adding a simple npn transistor key gives ability to control this iris with gpio signals from the Raspberry. Diode D1 is used as protection circuit for the GPIO. C1 is a bypass capacitor helps to protect whole circuits from the possible voltage transients. 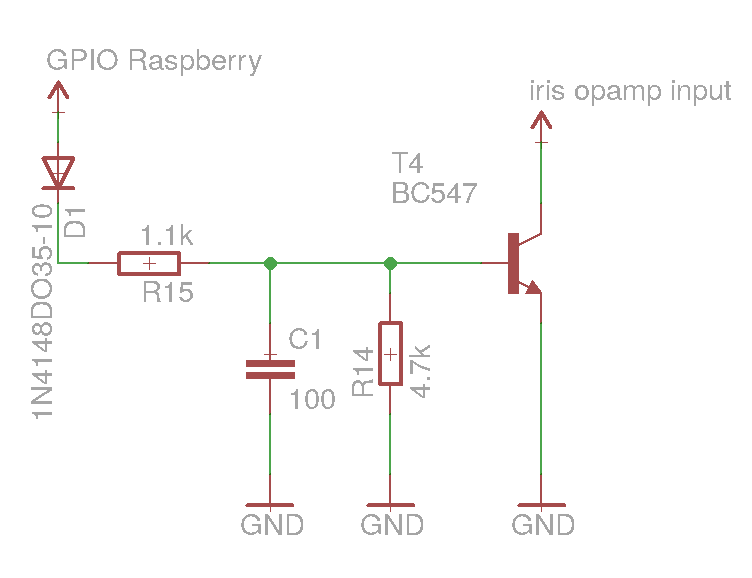 This controlling circuit is connected to the Raspberry GPIO pin 16 (but you can use any free pin). Software is very simple. To easley access to the GPIO I’m using popular bcm2835 library. One of the version is in camera github repository. You need to compile and install this library. Now we can open and close our iris with commands iris_control 0 and iris_close c respectively. Source code of the camera utility is written on C++ and also available on github. This program is doing shots with selected gain/exposure time params. Results is saving as FITS files. FITS – is an open standard defining a digital file format useful for storage, transmission and processing of scientific and other images. FITS is the most commonly used digital file format in astronomy. Unlike many image formats, FITS is designed specifically for scientific data and hence includes many provisions for describing photometric and spatial calibration information, together with image origin metadata. Image data in the FITS is uncompressed which is very good for the next processing steps. Core of this program is a QHYCCD protocol which was taken from the official repository of the vendor (now this sources is removed for some reason). You can find protocol implementation in a qhy5ii.cpp file. Communication with camera is made through libusb. Here is interface claiming and initialization. All we need is a VID and PID of the device. All we need to know is a vendor’s “magic” numbers for the commands and options. You can find everyting in source files. Check out functions CtrlMsg and EepromRead for example. You can find functions in my source for every of this steps. Functions names is corresponding to what they doing. Frame buffer is unsigned char array with size of the image width * height. This array is holding 2d matrix of the image, line by line. Every byte is representing one pixel with value from 0 (black) to 255 (white). In this way data is writing in to the FITS file. Writing and reading FITS files is made using cfitsio library. I wrote a little wrapper C++ class FitsHandler. This class is holding image buffer and can write this buffer to the new FITS file and load this buffer from some existing file. Also can be set FITS header data. Never try to call fits_create_file() on existing file. This function doesn’t support overwriting and error will be raised. Existing file must be removed (with unlink(), for example) before calling fits_create_file(). Correct type of the data can be chosen by bitpix value, which was initialized with fits_get_img_type(). imagebuf can be filled with data from the actual device. Always check status, non-zero values means that something goes wrong. Additional and very useful feature of this class is subtraction of the images. This method just subtract one image matrix from another. Simple arithmetic method. Both image buffers must be same size. Subtracting frames we can remove cmos matrix noise and amplifier noise. This can be done by using special calibration files – dark and bias. This is a regular FITS files shooted with this qhy utility. Dark file is shooting with closed iris and with long exposure and big gain, just like a normal exposition. 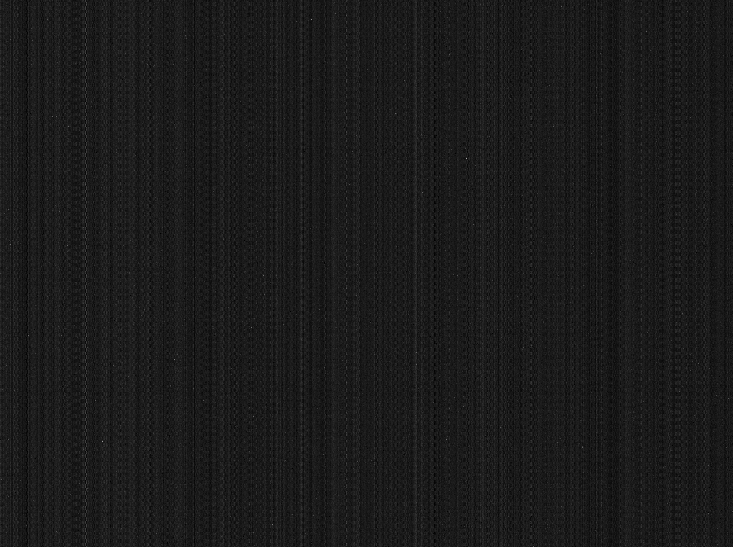 Resulting image contains only hot pixels and matrix noise on dark background. Bias is the same but only gain is high. Exposure is fastest as possible – 1ms for example. Resulting image contains only noise of the amplifier (and ADC probably). Typical bias: Subtracting matrix of the dark/bias we can remove all this pixels values and get more clear image of the sky. It’s always a good idea to subtract bias as from image itself and from the dark image. Fits header is a simple key-value pairs in ASCII (usually). Typical content is file creation date, object, coordinates, conditions and additional technical information. Calibration files and fits header data is passed to the qhy program as arguments. Please refer main.cpp to see how all this logic is works. Left column is a key and right is a value. Below this header is binary data of the image. In the next article i will describe astrocamera script where most of the camera logic is done.